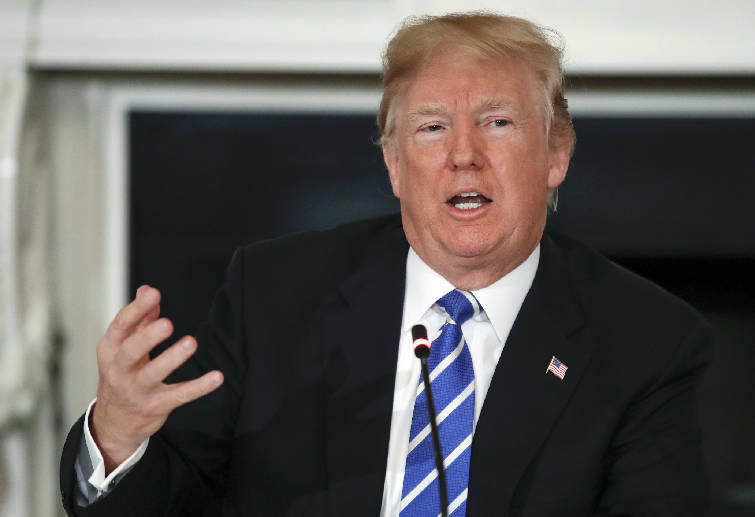 WASHINGTON (AP) — President Donald Trump unveiled a $4.4 trillion budget plan Monday that envisions steep cuts to America's social safety net but mounting spending on the military, formally retreating from last year's promises to balance the federal budget. The president's spending outline for the first time acknowledges that the Republican tax overhaul passed last year would add billions to the deficit and not "pay for itself" as Trump and his Republican allies asserted. If enacted as proposed, though no presidential budget ever is, the plan would establish an era of $1 trillion-plus yearly deficits. The open embrace of red ink is a remarkable public reversal for Trump and his party, which spent years objecting to President Barack Obama's increased spending during the depths of the Great Recession. Rhetoric aside, however, Trump's pattern is in line with past Republican presidents who have overseen spikes in deficits as they simultaneously increased military spending and cut taxes. "We're going to have the strongest military we've ever had, by far," Trump said in an Oval Office appearance Monday. "In this budget we took care of the military like it's never been taken care of before." 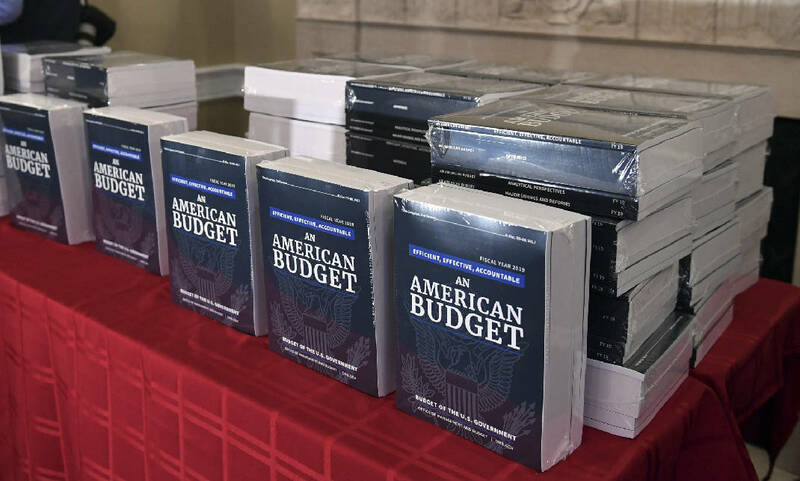 Trump's budget revived his calls for big cuts to domestic programs that benefit the poor and middle class, such as food stamps, housing subsidies and student loans. Retirement benefits would remain mostly untouched by Trump's plan, as he has pledged, though Medicare providers would absorb about $500 billion in cuts — a nearly 6 percent reduction. Some beneficiaries in Social Security's disability program would have to re-enter the workforce under proposed changes to eligibility rules. While all presidents' budgets are essentially dead on arrival — Congress writes and enacts its own spending legislation — Trump's plan was dead before it landed. It came just three days after the president signed a bipartisan agreement that set broad parameters for spending over the next two years. That deal, which includes large increases for domestic programs, rendered Monday's Trump plan for 10-year, $1.7 trillion cuts to domestic agencies such as the departments of Health and Human Services, Agriculture and Housing and Urban Development even more unrealistic. The White House used Monday's event to promote its long-awaited plan to increase funding for infrastructure. The plan would put up $200 billion in federal money over the next 10 years in hopes of leveraging a total of $1.5 trillion in infrastructure spending, relying on state and local governments and the private sector to contribute the bulk of the funding. But after his aides talked up that plan over the weekend, Trump suggested that his infrastructure proposal wasn't a big deal for him. "If for any reason, they don't want to support to it, hey, that's going to be up to them," he said of the Republican-controlled Congress. "What was very important to me was the military; what was very important to me was the tax cuts." Trump also is proposing work requirements for several federal programs, including housing subsidies, food stamps and Medicaid. Such ideas have backing from powerful figures in Congress including Republican House Speaker Paul Ryan of Wisconsin, who promises action on a "workforce development" agenda this year. There was immediate opposition from Democrats. "The Trump budget proposal makes clear his desire to enact massive cuts to health care, anti-poverty programs and investments in economic growth to blunt the deficit-exploding impact of his tax cuts for millionaires and corporations," said Rep. John Yarmuth of Kentucky, the top Democrat on the House Budget Committee. Some Republicans, on the other hand, said spending was much too high. Trump's plan aims at other familiar targets. It would eliminate the Corporation for Public Broadcasting, the National Endowment for the Arts and National Endowment for the Humanities, and the Institute of Museum and Library Services. The administration wants NASA out of the International Space Station by 2025 and private businesses running the place instead. But the domestic cuts would be far from enough to make up for the plummeting tax revenue projected in the budget. Trump's plan sees a 2019 deficit of $984 billion, though White House Budget Director Mick Mulvaney admits $1.2 trillion is more plausible after last week's congressional budget pact and $90 billion worth of disaster aid is tacked on. That would be more than double the 2019 deficit the administration promised last year. All told, the new budget sees accumulating deficits of $7.2 trillion over the coming decade; Trump's plan last year projected a 10-year shortfall of $3.2 trillion. And that's assuming Trump's rosy economic predictions come true and Congress follows through — in an election year — with politically toxic cuts to social programs, farm subsidies and Medicare providers. Last year Trump's budget promised such ideas could generate a small budget surplus by 2027; now, his best-case scenario is for a $450 billion deficit that year, more than $300 billion of which can be traced to his December tax cut. In stark numbers, the budget rewrites the administration's talking points for last year's tax plan, which administration figures such as Treasury Secretary Steven Mnuchin promised would more than pay for itself. "Not only will this tax plan pay for itself, but it will pay down debt," Mnuchin declared in September. Instead, Trump's budget projects that tax revenues will plummet by $3.7 trillion over the 2018-27 decade relative to last year's "baseline" estimates. The budget also includes $1.6 billion for the second stage of Trump's proposed border wall, a 65-mile segment in Texas' Rio Grande Valley. Trump's request last year for 74 miles of wall in San Diego and the Rio Grande Valley is pending before lawmakers right now. Once again, there's no mention of how Mexico would have to pay for it, as Trump repeatedly promised during the presidential campaign and after his victory. The plan reprises proposals to curb crop insurance costs, cut student loan subsidies and reduce pension benefits for federal workers. They went nowhere last year. Trump's plan promises 3 percent growth for the nation's economy, continuing low inflation and low interest yields on U.S. Treasury bills despite a flood of new borrowing. That likely underestimates the mounting cost of financing the government's $20 trillion-plus debt, many economists say. Mark Zandi, chief economist at Moody's Analytics, said a surge in stimulus from higher government spending and tax cuts would boost growth but for only for a short time. "This will meaningfully raise the odds that after juiced-up growth in 2018 and 2019, we will get a much weaker economy, possibly a recession in the next decade," Zandi said. "In good times, budget policy should be working to get the deficits down because bad times are sure to come."